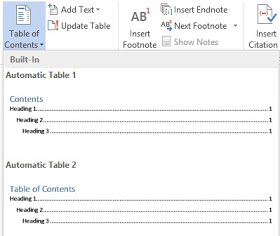 Microsoft Word can be seen as a complete tool use for publishing, only that it doesn't allow the typing of manuscript, but with it, you can automatically generate Table of content (TOC), build index if you want and lots of more. In this post, I will be sharing with you the simplest and stress-free method of generating Table Of Content for your Manuscript using Microsoft Word. As I promised earlier that I would make this tutorial easier for all, so will I fulfill. Now, Note the below formatting tips as with these tips, you will find it easier to ceate the table. ==>For First Tip: Do make sure you Use Heading 1 Tags for creating Chapter titles; when you highlight the title, simply click on Heading 1 which can be seen under the Home category located at the very top of your PC screen while in Microsoft Word. ==>Second tip: Make sure you Use the Heading 2 tags for all the subtitles you wish to add to your table of contents. ==>Third Tip: Use the Heading 3 for any other important items you wish to add below the subtitles contained in your (TOC) table of content. After you must have formatted your manuscript as guided or highlighted above, Next is to follow these below steps meticulously in order to generate the table of content as you want. Select your choice of Style from the list of the provided options and MICROSOFT WORD will generate the table of content automatically as you want. Remember it generate the table of content according to the formatting and style you selected earlier. Highlight the item you want to add or remove from your manuscript and format it with any of the Heading Tag you wish to add it to, or remove and replace the already Heading Tag with another Head tag. Navigate to REFERENCES > found beside the Table Of Content Tab (TOC), Click on where you see UPDATE TABLE, once you do that, your Table of Content will automatically update it self thereby reflecting your changes. That's it friend. Was this post helpful to you? If yes, kindly tell us your experience while creating your own (TOC) by your self through the guide provided above. Don't forget to share to your friends on Facebook, Google+, Twitter social media with the below share buttons. Thanks.